Other than a departure point for pelagics, it has been over 15 years since I have birded Cape Cod. Too long. Every late summer and early fall in particular, it’s “we really should get to the Cape” for shorebirds, especially South Beach and Monomoy Island. Well, my visit this weekend only wet my pallet for a future, more birding-intensive visit. I was asked to join the Leica Sports Optics team of good friends Jeff Bouton and David La Puma at their booth for the first annual Cape Cod Bird Festival. 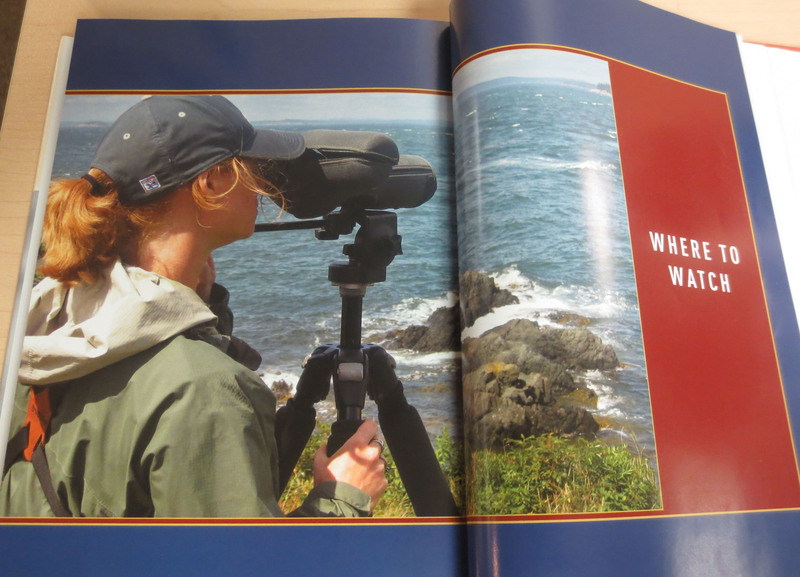 As the only Authorized Leica Optics dealer in Northern New England, I had multiple roles to play. First, it was to be the retailer of any optics sales. Secondly, I was there to use my first-hand experience in telling the story of the Critically Endangered Spoon-billed Sandpiper. Leica has recently become a leading sponsor of the international effort to save this unique species. And finally, I was there to sign some copies of my book. Oh yeah, and do some birding and beer-ing with Jeff and David, of course. The weather forecasts as of Thursday suggested that some good movements of migrants were about to occur. I went to bed optimistic that the first flight would occur behind the front for Friday morning (see previous blog entry), but as I woke up to rain still falling, I knew that this was not to be. Therefore, I began my trek southward, stopping for a short visit at Fort Foster in Kittery. That short visit lasted a little longer than expected, as I found not one, but TWO Connecticut Warblers! With rain still falling, I left the camera in the car. Of course, this usually results in some exceptional photographic opportunity. Yup, sure did. 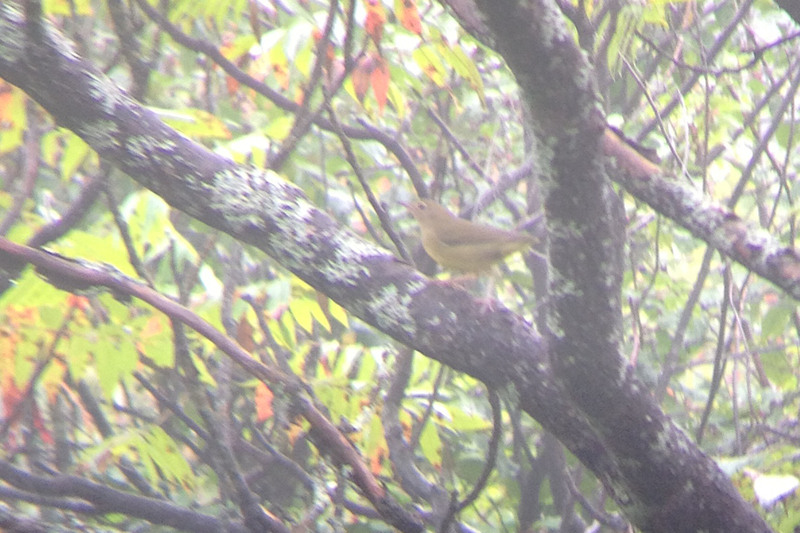 A Connecticut Warbler (CONW) – normally a frustratingly secretive skulker in migration, walked out (the fact that it was walking, one foot in front of the other, rather than hopping itself helps to clinch the birds’ identity) onto a low branch at the edge of thick brush. I lamented the lack of a camera, but was enthralled with my view. A short while later, I was even more shocked to see a second CONW walking out into the relative open! This time, I remembered that there was an iPhone in my pocket, and out of sheer desperation, I held it up to my binoculars and shot away. It actually worked…a phone-binned CONW! (This, as a friend pointed out, may have been a first-ever occurrence). My best shot – relatively speaking of course – was this one. But this other shot nicely shows the very pink legs and exceptionally long undertail coverts. Oddly enough, with the exception of plenty of Common Yellowthroats, I only encountered three migrant warblers this morning…and two were CONW! 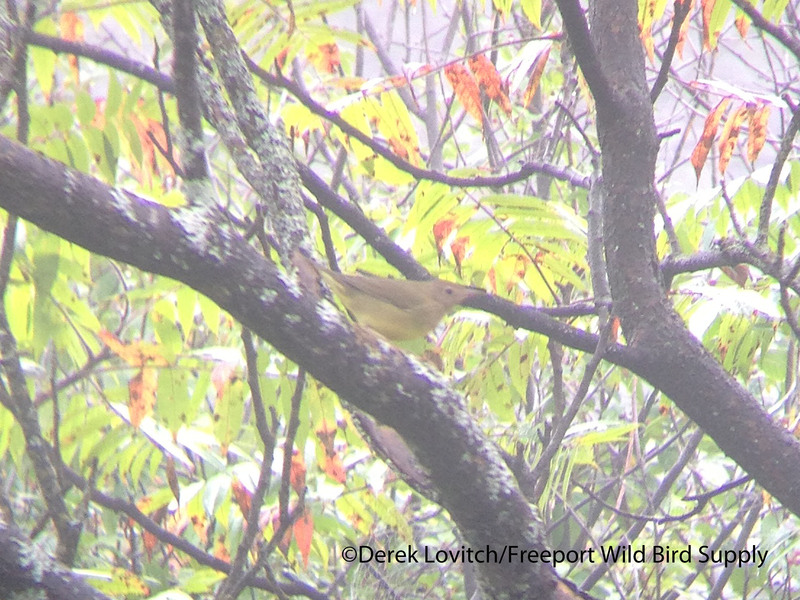 (The other being my first Palm Warbler in southern Maine this fall). 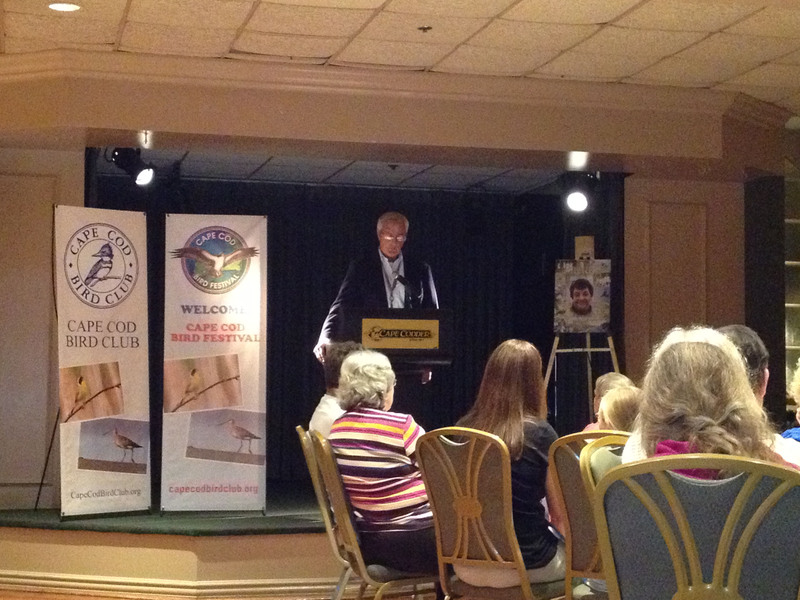 After stopping at Kelly’s Roast Beef, I finally arrived at my destination for the weekend, The Cape Codder in Hyannis. Meeting up with David and Jeff, we got to work, and it was nice to run into quite a few other friends over the course of the weekend. David – radar guru and creator of www.Woodcreeper.com – and I were (I know this will come as a surprise) glued to the NEXRAD images and wind forecasts in the evening, hoping to make a sound prediction for the hot birding. 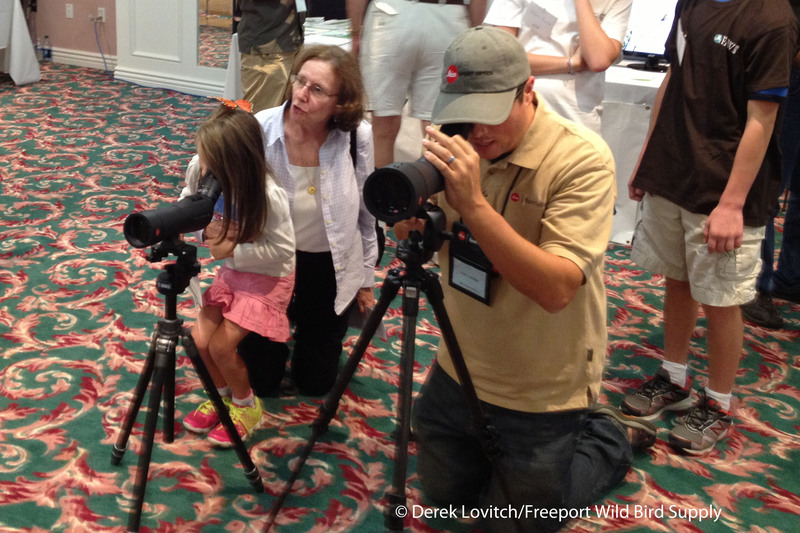 David works with the next generation of Leica fans. Well, perhaps we should have tried elsewhere, as Harding Beach in Chatham was not the place to be. In fact, we tallied the reorienting migrants on one hand (although we didn’t exactly make it there in time for sunrise). There weren’t many passerines around the woods at Morris Island, either. 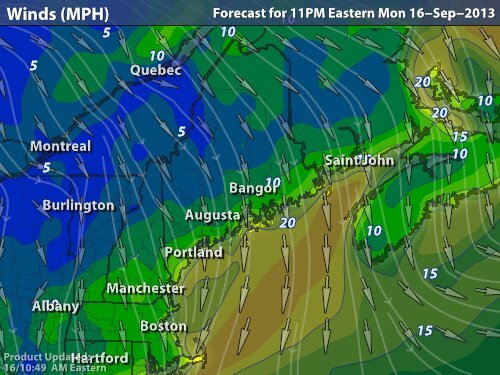 Looking at the overnight radar images, and seeing that winds were light north (instead of the forecasted NW), it was obvious that the big flight out onto the Cape just didn’t occur. I guess the silver lining to this was that we didn’t have too hard of a time pulling ourselves away to spend the rest of the day inside. 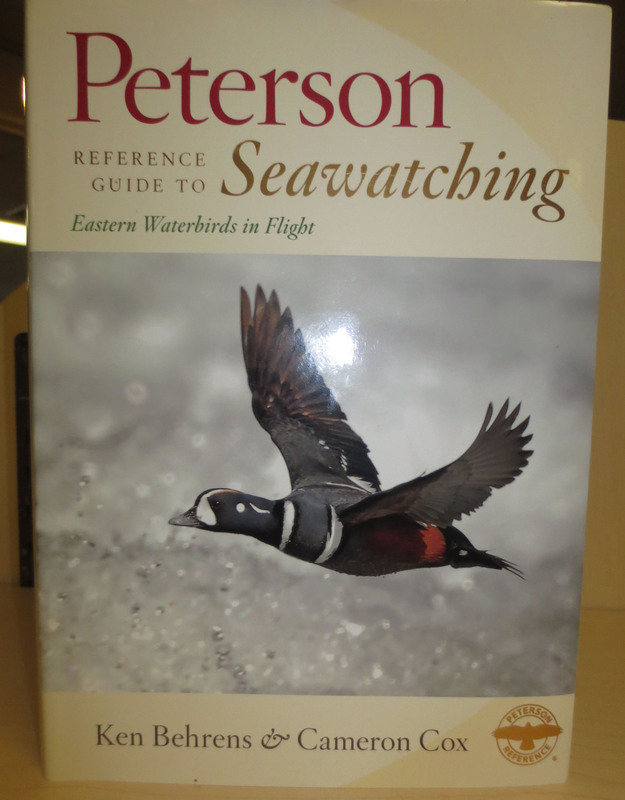 At least I had my brand new review copy – thanks to the good folks over at the Houghton Mifflin booth – of the Peterson Reference Guide to Seawatching: Eastern Waterbirds in Flight by my friends Ken Behrens and Cameron Cox to page through. And look who I found inside! Come evening, we enjoyed seeing Pete Dunne in his native habitat: captivating a room full of birders with his story-telling. Afterwards, David and I checked the radar once again. 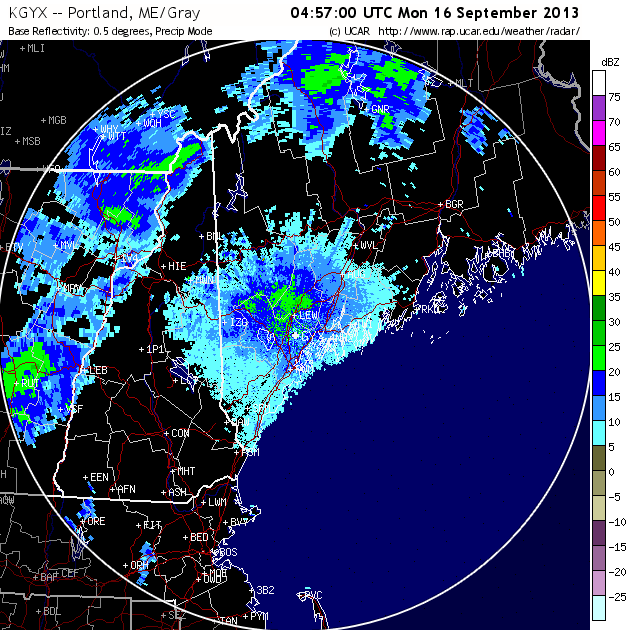 And once again, we saw birds on the radar, but few birds east of Boston. Take a look at the 1am radar and velocity images from the Boston area NEXRAD. 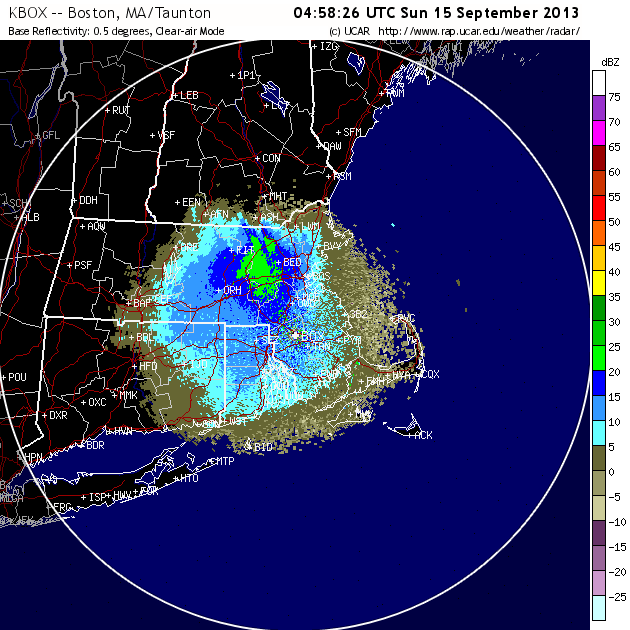 The winds were just too light to push birds well out of Cape Cod Bay, apparently. At least we didn’t have to make a decision as to where to start the day, as the three of us were on our way to the harbor to take part in the festival’s pelagic trip. 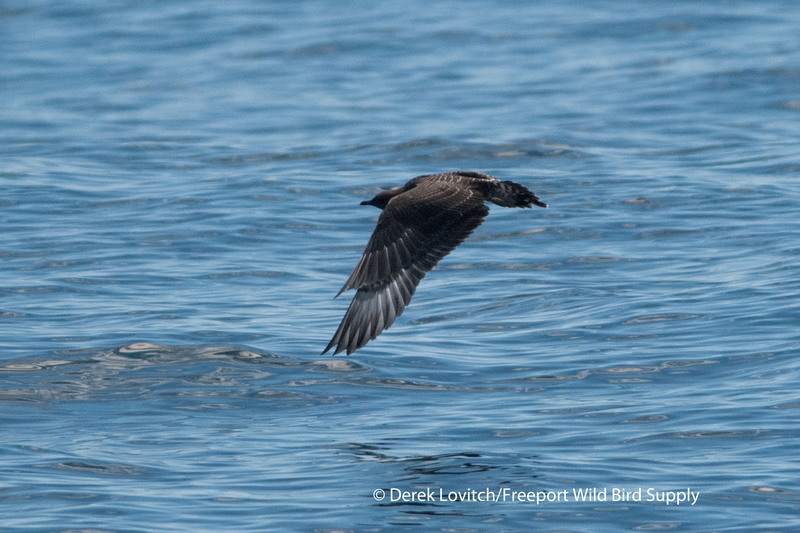 Like the waters north of Cape Cod (until your reach the waters off of Mount Desert Island), the summer seabirding has been dreadfully slow overall, so expectations were not too high. The first half of the trip was living up to said low expectations, but things really picked up in the last few hours, as were well east of Cape Cod. While the least expected seabird (for the season and the area) was probably the Leach’s Storm-Petrel, the highlight for me was this cooperative juvenile Long-tailed Jaeger. Although a fairly dark individual, we can see the fairly slim build, small head and bill, and overall more “gentle” appearance. I flight, it seemed slim and attenuated. The photos show the two white primary shafts on the upperwing, and the rounded central tail feathers. 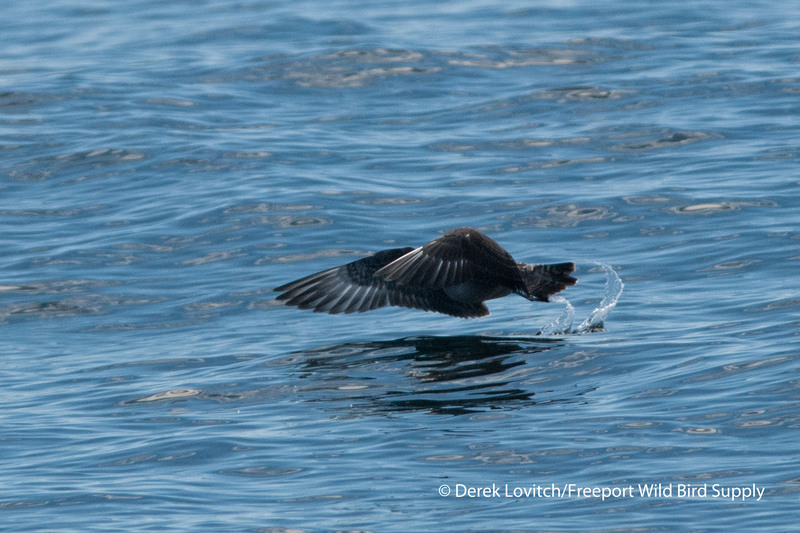 We also saw at least two Parasitic Jaegers, including this one chasing a juvenile Common Tern. 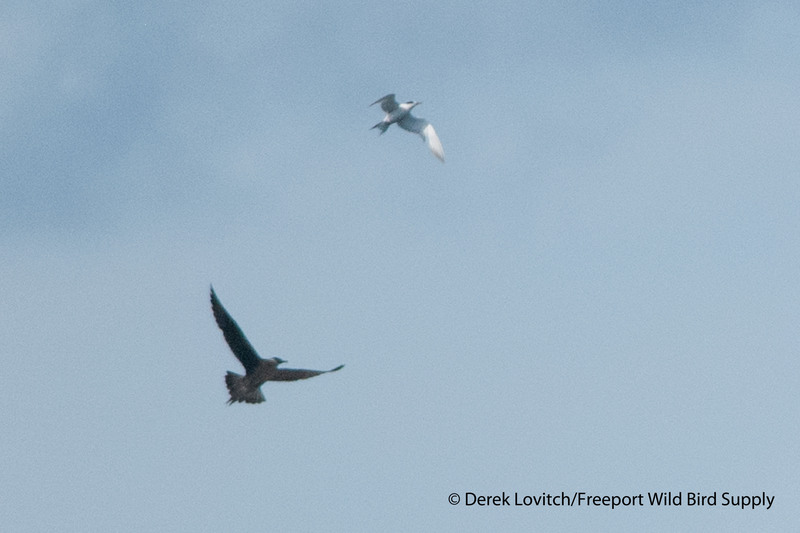 Four more unidentified, distant jaegers added to the strong finish – any day with jaegers is a good day in my book. Other highlights included a Black Tern, 14 Sooty, 5 Great, and 1 Manx Shearwater, some good looks at Red-necked Phalaropes, two Basking Sharks and a Mola Mola, but only a couple of Minke Whales. 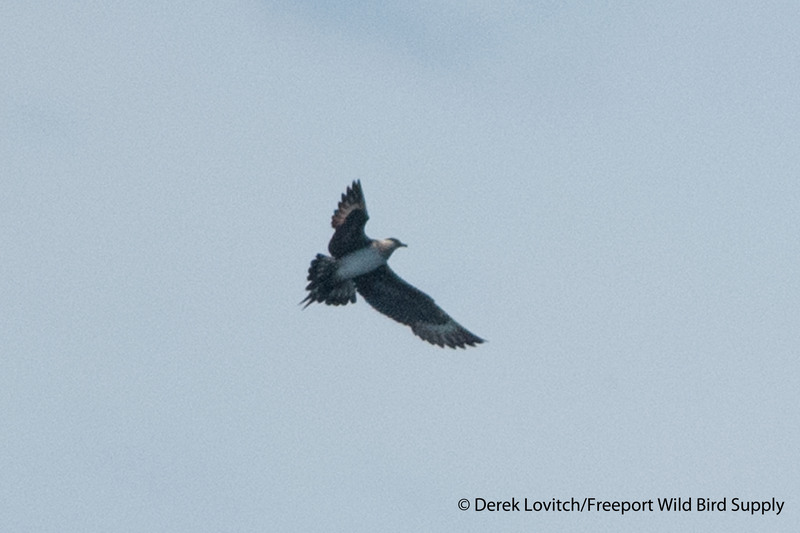 The cloud of Tree Swallows over Monomoy was quite impressive, as were some of the offshore landbirds: a Cape May Warbler, a Magnolia Warbler, a Northern Harrier, and an immature Black-crowned Night Heron – the latter of which was voicing its displeasure about being about 15 miles from shore, heading back north towards the Cape. Three bats – at least one that I conclusively identified as a Red Bats, three Lesser Black-backed Gulls, two early Great Cormorants, and a “pelagic” Cloudless Sulfur rounded out what, in the end, was actually a fairly productive outing. It was a long drive home afterwards, however. Luckily, southwesterly winds suggested I wouldn’t have to wake up early to get to Sandy Point for dawn. However, take a look at the radar image. Once again, I’ve included the 1am image for the example. It looks like a ton of birds! But the velocity image suggested little to no speed for whatever was in the air (it was not foggy last night), so I do not know what it was. There was little overhead in the morning in either our yard or at Old Town House Park, so I don’t think I was mistaken about this not being a big flight of birds. Furthermore, in a short listening session before going to bed, I heard very, very little. Tonight, however…well, let’s just say that I will be at Sandy Point tomorrow morning! I just hope the winds stay more northwesterly than north, or – gasp – northeasterly by morning as currently suggested by the wind forecast I like to use. This entry was posted in Birding "Away" and tagged Birding, Cape Cod, Cape Cod Bird Festival, Connecticut Warbler, Fort Foster, How to Be a Better Birder, Leica Sport Optics, Long-tailed Jaeger, migration, Parasitic Jaeger, pelagics, Peterson Reference Guide to Seawatching, radar, Spoon-billed Sandpiper, Weather on September 16, 2013 by Derek. Isn’t that the way? Leave your camera in the car, and find two Connecticuts! Great idea for using your cell phone camera and bins!